Cisplatin is an inorganic platinum complex, which is able to inhibit DNA synthesis by conforming DNA adducts in tumor cells. CX-5461 is an inhibitor of rRNA synthesis, selectively inhibits Pol I-driven transcription of rRNA with IC50 of 142 nM in HCT-116, A375, and MIA PaCa-2 cells, has no effect on Pol II, and possesses 250- to 300-fold selectivity for inhibition of rRNA transcription versus DNA replication and protein translation. Capecitabine is a tumor-selective fluoropyrimidine carbamate, which achieves higher intratumoral 5-FU level with lower toxicity than 5-FU. Fludarabine Phosphate is an analogue of adenosine and deoxyadenosine, which is able to compete with dATP for incorporation into DNA and inhibit DNA synthesis. Cytarabine is an antimetabolic agent and DNA synthesis inhibitor with IC50 of 16 nM in wild-type CCRF-CEM cells. Nelarabine is a purine nucleoside analog and DNA synthesis inhibitor with IC50 from 0.067-2.15 μM in tumor cells. Cladribine is an adenosine deaminase inhibitor for U266, RPMI8226, and MM1.S cells with IC50 of approximately 2.43 μM, 0.75 μM, and 0.18 μM, respectively. Raltitrexed is a thymidylate synthase inhibitor with an IC50 of 9 nM for the inhibition of L1210 cell growth. Clofarabine inhibits the enzymatic activities of ribonucleotide reductase (IC50 = 65 nM) and DNA polymerase. Ifosfamide is a nitrogen mustard alkylating agent used in the treatment of cancer. Dacarbazine is a triazene derivative with antineoplastic activity. 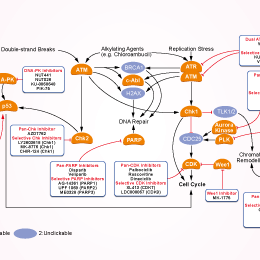 Dacarbazine alkylates and cross-links DNA during all phases of the cell cycle, resulting in disruption of DNA function, cell cycle arrest, and apoptosis; used in the treatment of various cancers. Hydroxyurea is an antineoplastic agent that inhibits DNA synthesis through the inhibition of ribonucleoside diphosphate reductase. Floxuridine is an antineoplastic antimetabolite, used in the treatment of colon carcinoma and colorectal cancer that has metastasized to the liver. Mercaptopurine is a widely used antileukemic agent and immunosuppressive drug that inhibits de novo purine synthesis through incorporation of thiopurine methyltransferase metabolites into DNA and RNA. Mizoribine is an imidazole nucleoside, selectively inhibits inosine monophosphate synthetase and guanosine monophosphate synthetase. Carmofur is a highly potent acid ceramidase inhibitor, used in the treatment of breast and colorectal cancer. Fidaxomicin is a narrow spectrum macrocyclic antibiotic that inhibits RNA polymerase sigma subunit. Metronidazole, a synthetic antibacterial and antiprotozoal agent of the nitroimidazole class, is used against protozoa. Rifapentine is an antibiotic, which inhibits DNA-dependent RNA polymerase activity, used to treat tuberculosis. Trifluridine is an anti-herpesvirus antiviral agent by interacting viral DNA replication, used primarily on the eye. Rifaximin is a RNA synthesis inhibitor by binding the β subunit of the bacterial DNA-dependent RNA polymerase, used to treat traveler's diarrhea caused by certain bacteria. Procarbazine HCl is a hydrochloride salt form of procarbazine which is a polyfunctional alkylating compound, used for the treatment of Hodgkin's lymphoma. Vidarabine is an antiviral drug by interfering with the synthesis of viral DNA, used to treat herpes simplex and varicella zoster viruses. Rifampin is a DNA-dependent RNA polymerase inhibitor, used to treat a number of bacterial infections. Mechlorethamine is the prototype of alkylating agents, it works by binding to DNA, crosslinking two strands and preventing cell duplication. Tegafur (FT-207, NSC 148958) is a substance being used in the treatment of some types of cancer. Nedaplatin is a derivative of cisplatin and DNA damage agent for tumor colony forming units with IC50 of 94 μM. Triapine is a potent ribonucleotide reductase inhibitor with broad spectrum antitumor activity by inhibiting DNA synthesis. Phase 2. Mupirocin is an isoleucyl t-RNA synthetase inhibitor, used in the treatment of bacterial skin infections. Tubercidin, an adenosine analogue, is a nucleoside antibiotic. It is incorporated into DNA and inhibits polymerases, thereby inhibiting DNA replication and RNA and protein synthesis. This agent also exhibits antifungal and antiviral activities. Favipiravir (T-705) is a potent and selective RNA-dependent RNA polymerase inhibitor, used to treat influenza virus infections. CeMMEC1 is an N-methylisoquinolinone derivative that inhibits the second bromodomain of TAF1 (IC50=0.9 μM). 6-Mercaptopurine Monohydrate is a widely used antileukemic agent and immunosuppressive drug that inhibits de novo purine synthesis through incorporation of thiopurine methyltransferase metabolites into DNA and RNA. SCR7 is a specific DNA Ligase IV inhibitor, which blocks nonhomologous end-joining (NHEJ). Psoralen is a naturally occurring furocoumarin that intercalates with DNA, inhibiting DNA synthesis and cell division. Cyclocytidine is the prodrug of cytarabine, which is a pyrimidine nucleoside analog that inhibits the DNA synthesis and used mainly in the treatment of leukemia. CRT0044876 is a potent and selective APE1 inhibitor with IC50 of ~3 μM. E3330 is a potent and selective APE1(Ref-1) inhibitor, which suppressed NF-kappa B DNA-binding activity. Sofosbuvir (PSI-7977, GS-7977) is a HCV NS5B polymerase inhibitor for the treatment of chronic hepatitis C virus (HCV) infection. B02 is a small-molecule inhibitor of human RAD51 with an IC50 of 27.4 μM, but does not inhibit its E. coli homologue RecA (IC50 > 250 μM). Carmustine is a cell-cycle phase nonspecific alkylating antineoplastic agent and used in the treatment of brain tumors and various other malignant neoplasms. BMH-21 is a DNA intercalator, which binds ribosomal DNA and inhibits RNA polymerase I (Pol I) transcription. Bergapten is a psoralen that can be photoactivated and is capable of crossing-linking DNA, covalently modifying proteins and lipids, and consequently inhibiting cell replication. Oxolinic acid is a quinolone antibiotic, inhibiting the enzyme DNA gyrase and DNA synthesis.It also acts as a dopamine reuptake inhibitor. Pritelivir (BAY 57-1293) is a potent helicase primase inhibitor, exhibiting antiviral effect on herpes simplex virus (HSV) with IC50 of 20 nM for both HSV-1 and HSV-2. CeMMEC13 is an isoquinolinone that selectively inhibits the second bromodomain of TAF1 (IC50 = 2.1 µM). Chlorambucil is a nitrogen mustard alkylating agent, used in the treatment of chronic lymphocytic leukemia. RK-33 is a first-in-class small molecule inhibitor of DDX3 (a RNA helicase) and causes G1 cell cycle arrest, induces apoptosis, and promotes radiation sensitization in DDX3-overexpressing cells. SMI is considered a general-purpose activator for DNA and RNA synthesis. Flupirtine maleate is the salt form of Flupirtine, which is a centrally acting non-opioid analgesia, is a selective neuronal potassium channel opener that also has NMDA receptor antagonist properties. Pyridostatin Trifluoroacetate Salt is a G-quadruplexe stabilizer with Kd of 490 nM in a cell-free assay, which targets a series of proto-oncogenes including c-kit, K-ras and Bcl-2. 2'-deoxyuridine is frequently halogenated to create thymidine analogues useful for studies of DNA synthesis and degradation mechanisms. Bendamustine HCL is a DNA-damaging agent with IC50 of 50 μM in cell-free assay. Lomustine inhibits cancer cells by damaging the DNA and stops cells from dividing. Bromodeoxyuridine (BrdU) is a nucleoside analog that competes with thymidine for incorporation into DNA, and used in the detection of proliferating cells. Adenine HCl is a hydrochloride salt form of adenine which is a purine derivative and a nucleobase with a variety of roles in biochemistry. Adenine sulfate is a sulfate salt form of adenine which is a purine derivative and a nucleobase with a variety of roles in biochemistry.